- ระยะโฟกัสใกล้สุด : 0.45 เมตร / 1.5 ฟุต. - ขนาด Filter : 52 มม. The Canon EF 50mm F1.8 II is the least expensive lens currently available for the EOS system, and has been in the lineup since late 1990. 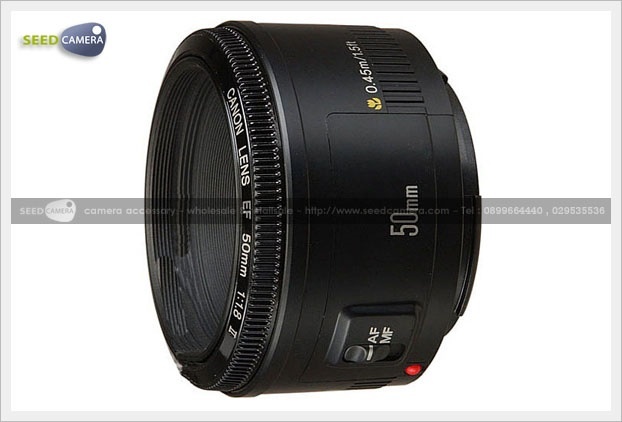 It's a simplified version of the original EF 50mm F1.8 of 1987 (often referred to as the 'Mark I') which was supplied as standard with some of Canon's earliest 35mm EOS SLRs; however it can trace its lineage back a lot further than that, as the company has been making 50mm F1.8 standard lenses since 1959. Like its predecessor, it uses simple symmetric Gaussian optics with six elements in five groups, in a well-proven formula which is known to offer excellent correction of aberrations. Although designed as a 'standard' lens for 35mm film, these days the 50mm F1.8 is far more likely to be seen doing service on APS-C format DSLRs, on which it behaves like a short telephoto portrait lens (80mm equivalent). it tends to attract the interest of Canon SLR users looking to start experimenting with fast lenses for low light and shallow depth of field work, or simply hoping to get sharper results than those which can be provided by the kit lens bundled with the camera body. It's also a potential option for those seeking a near-disposable lens to use in adverse conditions. Of course this isn't the only lens of its focal length in Canon's lineup, and potential buyers will often also be tempted by the EF 50mm F1.4 USM which we reviewed recently, despite its significantly higher price tag. So the question we'll be asking in this review is whether the slower lens offers such compelling value for money that it's an unmissable bargain, or if instead the inevitable compromises involved in hitting such a low price point are too much to tolerate.